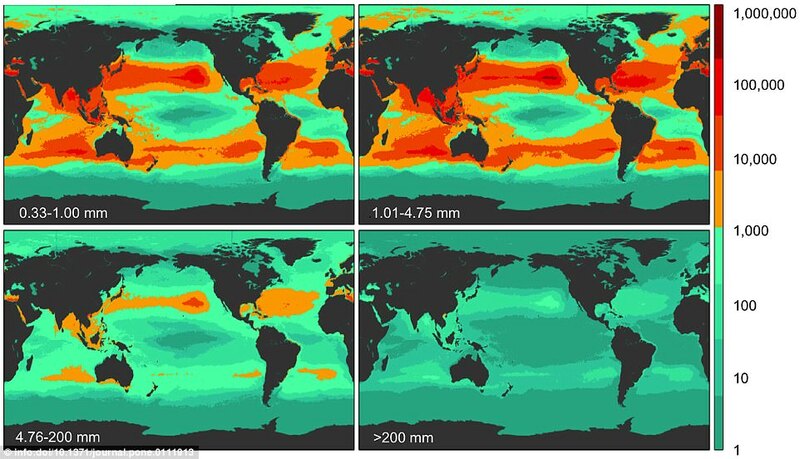 This interactive map shows how much plastic is found in the world's oceans. As much as 8 million tonnes of plastic is dumped into our oceans every year, endangering marine life and, if it enters the food chain, endangering humans too. Now, an interactive map has revealed where the 5.25 trillion pieces of plastic adrift in our oceans end up. Densities of plastic are shown as white dots around the map, each of which represents 20 kilograms (44 lbs) of damaging ocean waste. 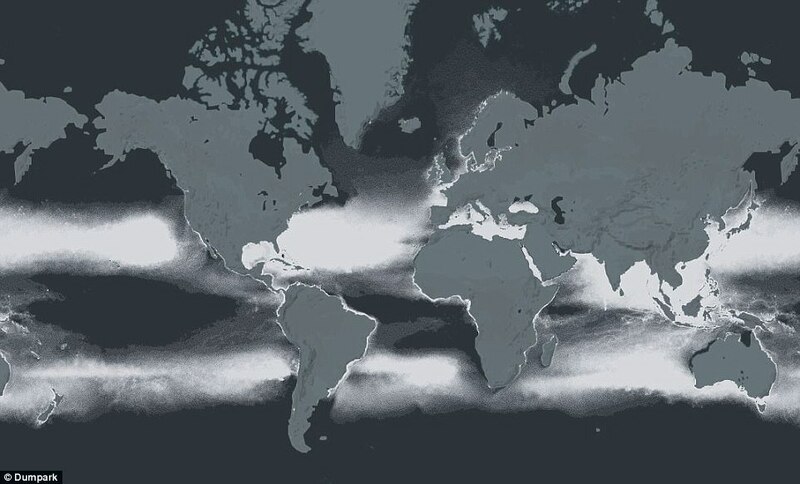 In the Sailing Seas of Plastic map, graphic designers at New Zealand-based data firm Dumpark visualised the estimated concentration of floating plastic debris in the world's oceans. When zoomed out, the map seems to show that plastics in the ocean are large floating landfills, 'but as you zoom in you realise the complexity of the issue: The ocean is quite a vast surface, and similar to a starry night, there are a lot of little bright dots,' said map researcher Mr Laurent Lebreton. The graphic reveals that the North Pacific Ocean suffers the most from plastic pollution, with an estimated 2 trillion individual pieces adrift in its waters. This works out at around 87 million kilograms (193 million lbs) of waste in total, nearly one third of plastic pollution in all oceans. 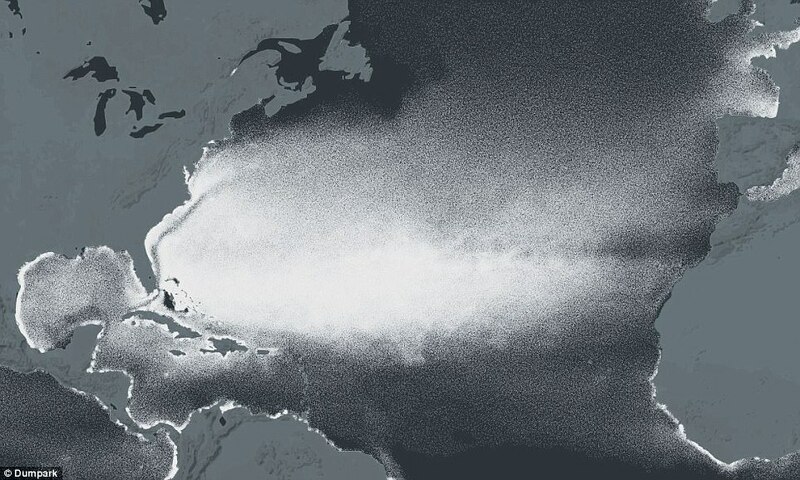 Much of this waste is focused around China and Japan, tracing the North Pacific gyre, one of Earth's five major gyres, which are powerful circular ocean current systems caused by wind patterns and the rotation of the Earth. 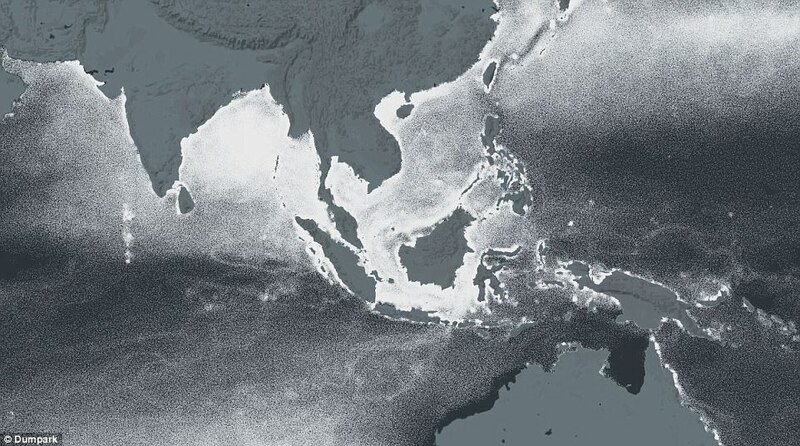 The map shows that the Indian Ocean is a hot spot for global plastic pollution, with 1.3 trillion pieces of floating plastic. Previous research has shown that as much as 60 per cent of the world's plastic waste comes from just five countries: China, Indonesia, Philippines, Vietnam, and Thailand. 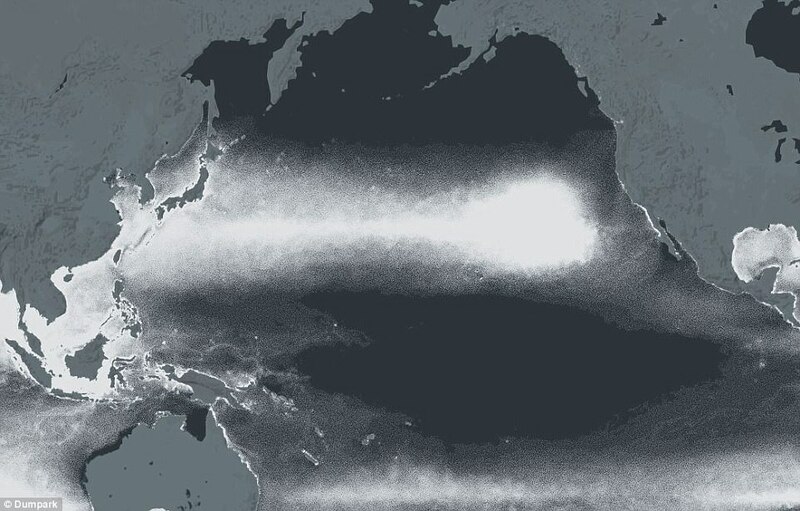 This is likely the reason the North Pacific and Indian Oceans are so heavily polluted, as gyres carry waste outwards from the coasts of these nations. 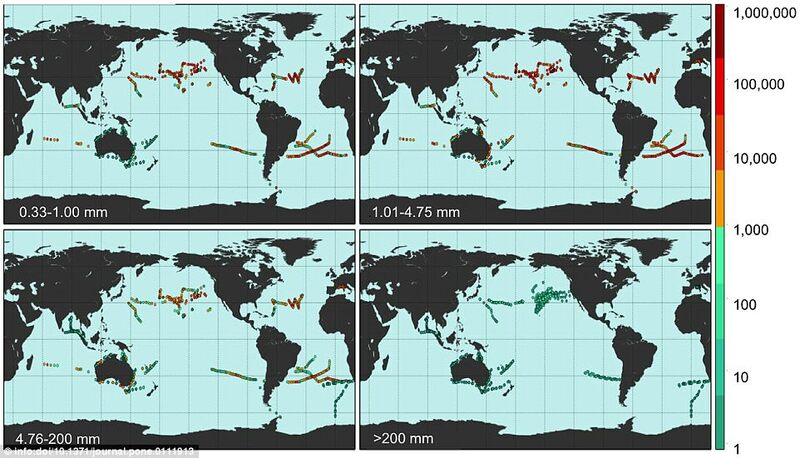 The map is based on a study titled 'Plastic Pollution in the World's Oceans' from oceanographer Dr Marcus Eriksen. According to the study, there are 5.25 trillion pieces of plastic in our oceans, enough to circulate our equator 425 times. Dr Eriksen and his team went on 24 nautical expeditions between 2007 and 2013 across all five of the Earth's major gyres. When zoomed out, the map seems to show that plastics in the ocean are large floating landfills, 'but as you zoom in you realise the complexity of the issue. The ocean is quite a vast surface, and similar to a starry night, there are a lot of little bright dots,' said map researcher Mr Laurent Lebreton. The researchers took in 680 loads of plastic on their trip and noted down 891 visual assessments of floating waste, then crafted a statistical model to work out how plastic is spread around the world's oceans. They found that, when added up, all of the ocean's plastics weigh more than 38,000 African elephants. 'The plastic industry suggests the only solution is through our own efforts — recycling, incineration, responsible personal waste management,' Dr Eriksen told Vox. Dr Eriksen and his team also investigated what types of plastic were polluting the oceans most. 'We found an astounding number of those little balls in deodorant roll-ons,' he said. The map is based on a 2014 study in which a team of oceanographers went on 24 nautical expeditions between 2007 and 2013 across all five of the Earth's major gyres. This image shows the numbers (right) of different sizes of plastic fragments (bottom left of each grid) that the team found. Red indicates a high density while green shows a low density. But the researchers said that most of the pieces of plastic they found was in confetti-sized shreds. Of the 5.25 trillion particles Dr Eriksen's team calculated, 92 per cent are microplastics, either broken-up bits of larger plastic items, or small pieces like facial scrub microbeads. 'Most of these microplastics are so small you can't really tell what they are,' Dr Eriksen said. BigThink : Where is the plastic in the Ocean coming from ? Try Asia.